In a skillet over medium heat, stir 1/4 cup of sugar with the pecans. Continue stirring gently until sugar has melted and caramelized the pecans. Transfer pecans onto waxed paper. Let cool. Blend oil, vinegar, 1 1/2 teaspoons sugar, mustard, garlic, salt, and pepper. 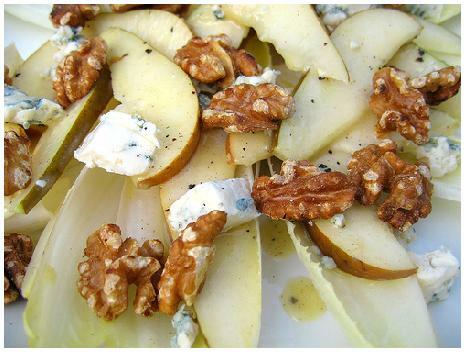 In a large serving bowl, place lettuce, pears, blue cheese, avocado, and green onions. Pour dressing over salad, sprinkle with pecans. Experiment with your own green salad recipes. Just about all raw fruits and veggies are good for a green salad. You can even add meats if you like. The sky's the limit. Lettuce, Spinach, Tomatoes, Cucumber, Onions, Peppers, Radishes, Mushrooms, Spinach, Carrots, Celery, Beans, Broccoli, Cauliflower, Olives, Red cabbage, Alfalfa sprouts, Avocado, Corn, cheese, fruits, nuts, hard-boiled egg and croutons. Cut bread slices into 1-inch squares. Heat butter just enough to melt it. Stir in Parmesan cheese, garlic powder, salt and pepper. Toss bread in the butter mixture until pieces are well coated. Place bread in a shallow glass baking dish, spread out enough so all the pieces can brown. Bake for 10 minutes (turning the pieces over with a spatula after 5 minutes), or until croutons are brown and crisp on the outside. Hit this link for Authentic American Recipes from every state. For more Grilled Fish Recipes, see the Main Course Recipe Page. Go here for Another Free Printable Recipe Collection.